Shown here on the Parkside door style in Alder. Butterscotch is a Stain  nish. 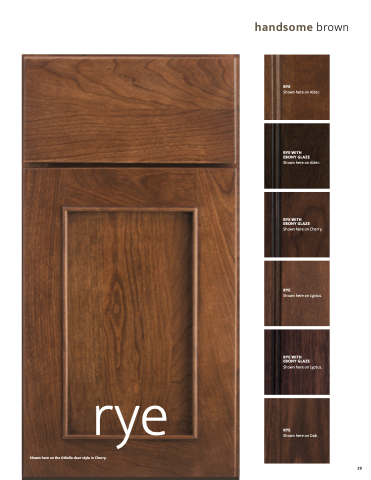 Shown here on the Oxford door style in Alder. Butterscotch with Chocolate glaze is a Stain with Glaze  nish. Shown here on the Belaire door style in Cherry. Butterscotch is a Stain  nish. Shown here on the En eld door style in Cherry. Butterscotch with Chocolate glaze is a Stain with Glaze  nish. Shown here on the Aledo door style in Cherry. Butterscotch with Ebony glaze is a Stain with Glaze  nish.